Sigma ransomware activity dropped in January and February of 2018, but during the past week or so, it's come back. I personally hadn't run across it, but I noticed Sigma ransomware from the same type of malspam campaign I reported in a diary last week. Today's diary looks at the wave of malspam pushing Sigma ransomware on Tuesday 2018-03-13. Shown above: Flow chart for an infection from this malspam. Shown above: Screenshot from the spreadsheet tracker with 10 email samples (part 1 of 2). Shown above: Screenshot from the spreadsheet tracker with 10 email samples (part 2 of 2). As early as Friday of last week, this campaign started using password-protected Word documents. 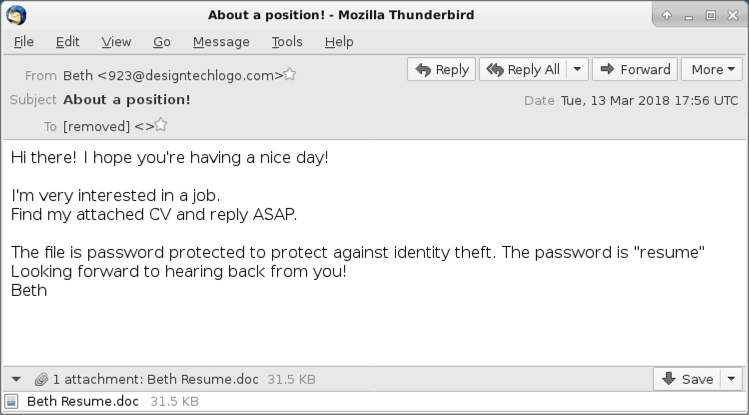 The password was always resume as stated in the emails' text. As usual for this type of malicious Word document, enabling macros will kick off the infection process. The enabled macro will cause the victim's host to retrieve a malware binary to infect a vulnerable Windows host. Shown above: Opening the attached Word document generates a prompt for the password. Shown above: After you enter the password, enable macros to start the infection process. Enabling macros caused my vulnerable Windows host to download a 3.1 MB Windows executable file stored in the user's AppData\Roaming directory as a .tmp file. After the .tmp file appeared, my Windows host had a tor client installed, and another file of the exact same size with a different file hash appeared in the same directory. After they had done their work, both files were quickly deleted from that location. Shown above: Some items in the user's AppData\Roaming directory during the infection. 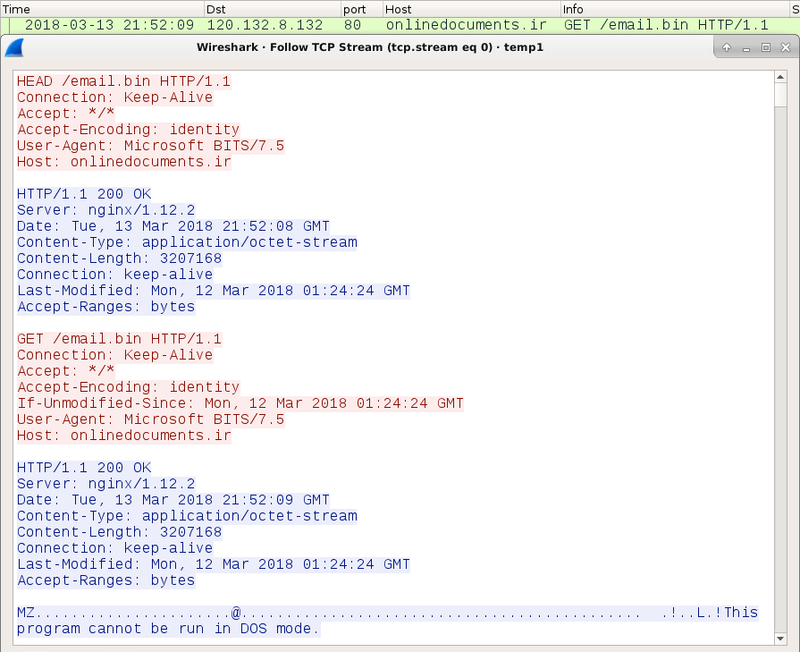 After macros were enabled on the Word document, the initial malware binary was downloaded over HTTP using TCP port 80, similar to what we saw this past Friday. The initial download was followed by an IP address check and tor traffic. Shown above: My lab host downloading the initial malware binary. Shown above: The initial malware binary download followed by an IP check and tor traffic. 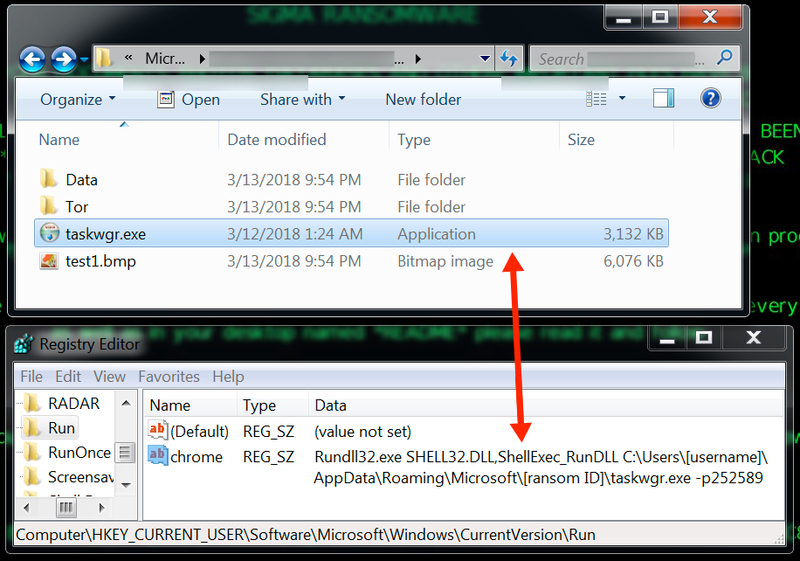 The infected Windows host looked the same as previously reported examples of Sigma ransomware infections. Encrypted files did not have any file extensions added. The ransomware decryptor listed $400 USD as the ransom cost. Shown above: Encrypted files and ransomware instructions on my infected lab host. Shown above: Sigma ransomware decryptor from my infected lab host. My infected lab host had additional files saved to the user's AppData\Roaming\Microsoft directory under a folder with the same name as the ransom ID used in the decryption instructions. An entry was added to the Windows registry to keep the infection persistent. Shown above: More artifacts on my infected lab host. See below for a list of URLs, domains, and file hashes associated with this malspam. Ransomware is still at low levels compared to last year, but I'm detecting a small uptick so far during March 2018. We'll see if this trend continues. 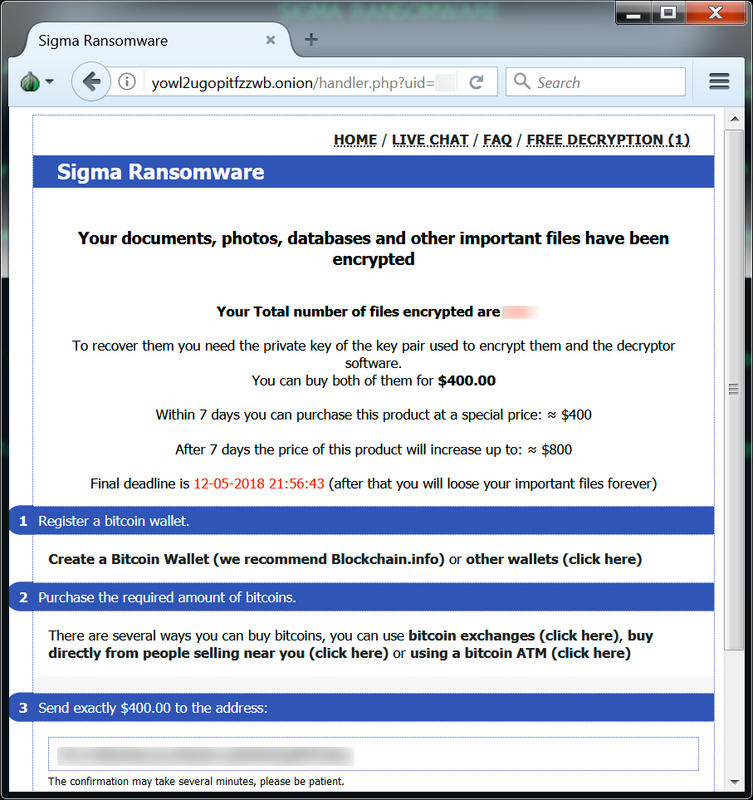 Even with the password-protected Word documents, this recent wave pushing Sigma ransomware is no more dangerous than previous ransomware-related malspam attacks. Criminals have already tried these tricks before. As always, properly-administered Windows hosts are not likely to get infected. 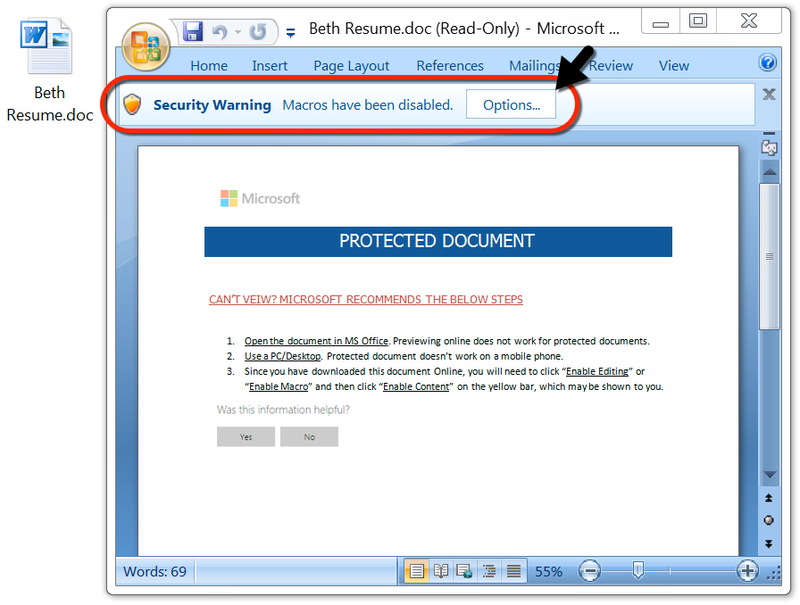 To infect their computers, users would have to bypass Protected View and ignore security warnings about activating macros on a Word document. System administrators and the technically inclined can also implement best practices like Software Restriction Policies (SRP) or AppLocker to prevent these types of infections.